Biography/Paintings of 15th Century Flemish Painter. Detail from the central panel. A leading figure in Flemish painting of the 15th century Netherlandish Renaissance, Dieric Bouts was strongly influenced by his older contemporaries Jan van Eyck (c.1395-1441), Petrus Christus (1410-75), and Roger van der Weyden (c.1400-64) under whom he may have studied. 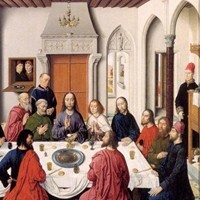 He was mainly active in Louvain, and was one of the first Flemish painters to use a single vanishing point, as illustrated in his triptych altarpiece painting The Last Supper (Louvain Cathedral, 1464-7). As well as altarpieces, he painted a considerable number of small devotional panel paintings, usually of the Virgin and Child or Christ Crowned with Thorns, but his figure drawing appears rather stiff to modern eyes and his characters look characteristically long and angular. Bouts adhered to the 15th century tradition of not dating or signing his paintings, so questions of authenticity linger in respect of several of his works. His Diptych of The Countess' Ordeal by Fire Before Emperor Otto III (1473, Royal Museums of Fine Arts, Brussels) however is one of few paintings confidently attributed to his brush. Born "Dieric", "Dierik" or "Dirk" Bouts, in Haarlem between 1410 and 1420, little is known about his early life or artistic training. He may or may not have been a student of Van der Weyden, but if not, he was certainly deeply influenced by Weyden's art. Bout's figures are often set in finely rendered landscapes and clothed in highly colourful garments painted with minute detail. He followed Van der Weyden's style of verticalization of figures and architecture, often distorting proportions. Whether this was the beginning of a distinctive Northern Renaissance style, or whether it was just part of a general trend in Europe is not clear. Some of the early works attributed to Bouts, including The Altarpiece of the Virgin (Prado, Madrid) are very similar in style to Van der Weyden: so similar in fact, that they are practically indistinguishable. It was only with Bouts' Descent From The Cross (1450s, Granada Cathedral) that a more personal style of painting emerged. The figures are still elongated, but the space around them is left empty to heighten the sense of contemplation. His Entombment (1450s, National Gallery, London) is another highly expressive and powerful work of religious art. Painted on linen, as opposed to wooden panel, it once formed part of a winged altarpiece. Although linen paintings were common in the Middle Ages very few survive today. Bouts personal style is perhaps best represented in his Diptych of The Countess' Ordeal by Fire Before Emperor Otto III (1473). This was painted towards the end of his life and was commissioned to hang in the new council room of Louvain Town Hall which was built in 1460. The final two panels were never completed and today it hangs in the Royal Museum of Fine Arts, Brussels. Bouts is sometimes referred to as a portrait painter because portrait art was a genre in which he excelled. His Portrait of a Man (1462, National Gallery, London) is considered by some a masterpiece. It is one of the first instances of a sitter shown in three-quarter view, with a landscape through an open window. Such views were traditionally only reserved for religious paintings. The man may have been Jan van Winckele, a notary connected to the University of Louvain. The Metropolitan Museum of Art, New York also has a Portrait of a Man (c.1470), which is attributed to Bouts as the sitter resembles figures in the Justice painting. There are also portrait paintings in the Royal Museum of Fine Arts in Antwerp and the National Gallery of Art in Washington DC, but their authorship remains unconfirmed. This work, also known as the Altarpiece of the Holy Sacrament, painted between 1464-7 and located in St Peters Church, Louvain, is one of the key works of Northern Renaissance art. The central panel represents The Last Supper and it is surrounded by 4 smaller panels depicting scenes from the Old Testament. In his Last Supper, Bouts breaks with convention by depicting Christ giving the Eucharist, rather than announcing the betrayal of Judus, as had hitherto been the tradition. Scholars believe this may in fact be the first Flemish panel painting to depict the Last Supper and to use a single vanishing point of linear perspective. All the orthogonals in the room (imagined lines perpendicular to the picture plane) converge and vanish in a point just above Christ's head. Through a window to the right of Christ's head, a landscape can be glimpsed, which has it own vanishing point. The complexity of the painting is increased by the inclusion of 4 servants, painted in Flemish clothes. At first it was thought they may have been the artist and his sons, but it is more likely they are the portraits of the donors who commissioned the altarpiece. In his own lifetime Bouts established himself as a successful painter, as evidenced by his 1469 appointment as Official Painter of the town of Louvain. Although a master of both tempera and the newer medium of oil painting, and an expert in the application of linear perspective, he remained firmly within the Northern tradition and borrowed little from Early Renaissance painting in Italy. He died in 1475 and was survived by his two sons, Aelbrecht (c.1455-1549) and Dieric The Younger (c.1448-91) who both became artists and continued Bouts' style - which influenced the Cologne School of Painting (1350-1500) as well as a number of painters active in the German Renaissance - into the 16th century. - The Altarpiece of the Virgin (1445) (Triptych) Prado Museum, Madrid. - The Fall of the Damned, The Way to Paradise (1450) Lille Fine Arts Museum. - Descent From The Cross (1450s) Granada Cathedral. - Entombment (1450s) National Gallery, London. - The Way to Paradise (c.1450) Musee des Beaux-Arts, Lille. - The Way to Hell (c.1450) Musee des Beaux-Arts, Lille. - Christ in the House of Simon (c.1460) Gemaldegalerie SMPK, Berlin. - Portrait of a Young Man (1462) National Gallery, London. - Ecce Agnus Dei (1462-64) Alte Pinakothek, Munich. - Mary and Child (c.1465) National Gallery, London. - The Last Supper Altarpiece (1464-7) St Peter's Church, Louvain. - The Pearl of Brabant (1467-8) Alte Pinakothek, Munich. - The Martyrdom of St Erasmus (1468) St Peter's Church, Louvain. - Portrait of a Man (c.1470) Metropolitan Museum of Art, New York. - The Countess' Ordeal by Fire Before Emperor Otto III (1473) Brussels.  Seilern Triptych (1410) Courtauld Institute, London.  Merode Altarpiece (c.1427) Metropolitan Museum of Art, New York.  Ghent Altarpiece (1432) Saint Bavo Catherdal, Ghent.  Portrait of a Man in a Red Turban (1433) National Gallery, London.  Arnolfini Portrait (1434) National Gallery.  Descent From the Cross (Deposition of Christ) (1435-40) Prado Museum.  Beaune Altarpiece (1446-52) Musee de l'Hotel Dieu, Beaune.  The Lamentation Before the Tomb (1450) Uffizi, Florence.  Portrait of Edward Grimston (1446) National Gallery, London.  The Donne Triptych (1480) National Gallery, London.  Portinari Altarpiece (Triptych) (1475) Uffizi, Florence.  God the Father Blessing (1506) Louvre Museum, Paris.  The Annunciation Altarpiece (1510) Royal Museum of Fine Arts Antwerp.  The Money-Lender and His Wife (1514, Louvre).  For more biographies of famous Flemish painters, see: Homepage.  For an analysis of other Netherlandish pictures, see: Famous Paintings Analyzed.